Texas's three goal second period keyed their victory on Saturday night over the visiting Toronto Marlies. Brett Ritchie picked up a goal and an assist on the night. 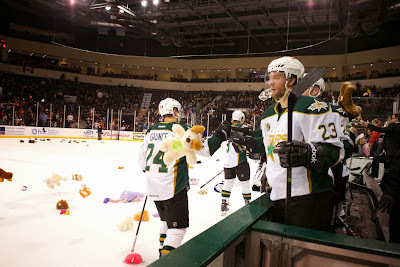 His goal was the first of the game and launched thousands of teddy bears onto the ice for the annual charity event. "I had a whole celebration planned if I scored it," said Ritchie. "I forgot to do it. I got too excited." "As a coach, you always worry you aren't going to score [on Teddy Bear Toss night]," added Coach Desjardins. "So it's always good when those go in." Beyond the first period goal, Texas had a three-goal second that put the game out of reach for the Marlies. "It really took the wind out of their sails," said Ritchie. Ritchie's goal in the first came as Cameron Gaunce walked the blue line and found a lane for a shot, earning the assist. Spencer Abbott evened things up in the second period with a solid finish on a behind-the-net pass from Greg McKegg. The Stars then got started on their goals. Curtis McKenzie got it started on the power play with a one-timer of his own, his sixth goal of the year. Only 27 seconds later, Chris Mueller redirected a Jokipakka shot past Drew MacIntyre for the 3-1 lead. Travis Morin found twine on another tip just two minutes later. Cameron Gaunce again had the primary assist with the initial shot. "In that scenario, I'm looking for sticks," said Gaunce. "Travis did a good job of giving me a target." Cameron Gaunce and his defensive partner, Jokipakka, were both plus-3 on the night. "Gaunce had a great game," said Desjardins. "He got pucks through and whenever you can do that, it helps." The Stars would trade goals with the Marlies therafter, but the damage was done. Carter Ashton backhanded one past York and then late the third Mike Hedden scored off a nice pass from Justin Dowling to set the final at 5-2. "You need to be able to put teams away," said Desjardins. "We got some breaks and we got rewarded." Woot! Thanks, Steven. I always like to read your informative analysis and recap. It helps to make sense if the numbers and give some insight into the players.